The days of using manual, "bubble-type" levels exclusively for home remodeling are gone. While the bubble level still retains a proud place in most DIY toolboxes, room is also made for one of the best tools to come around in recent years--the rotary laser level. Let's look at rotary laser level basics, as well as the more price-friendly products on the marketplace. A laser level is fixed in one place, often on the wall itself or at some central point in the room. A continuous laser beam forms a solid red line at a level point on horizontal and vertical areas. Fixed-place laser levels can be purchased for as little as $15. Rotary lasers tend to be more expensive. Does the Laser Level Itself Need to Be on a Level Surface? No. But it does need to be reasonably within level. What Are the Preferred Applications for Laser Levels? Bubble levels are terrible at indicating long lines (i.e., beyond the length of the level itself). So any instance where you need to determine a line more than 3-4 feet is perfect for laser levels. Laser levels work well for showing long lines (that don't necessarily need to be level), such as a line of the floor for tiling. 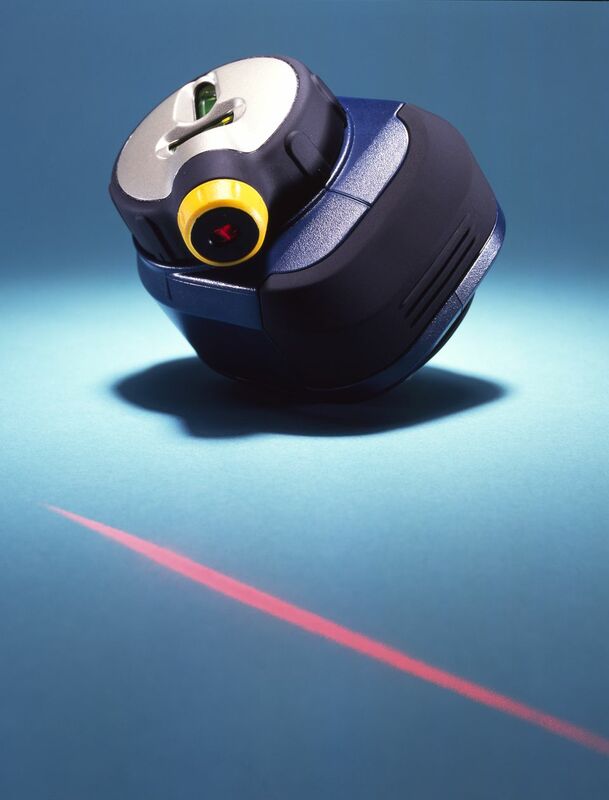 What Is a Rotary Laser Level? Fixed laser levels throw a level beam against a wall or floor. By contrast, rotary laser levels sit in the center of a room--preferably on a tripod--and cast a laser beam in a complete 360-degree circle. Thus, the rotary laser can show a laser "chalk line" on all four walls with complete accuracy. Or it can cut a vertical swath, hitting walls, ceiling, and floor simultaneously. You'll only find a small handful of tool manufacturers in the rotary laser level business. Johnson, Agatec, and Berger are the main names. This Berger Dual Beam Rotary Laser level can simultaneously throw a horizontal and a vertical beam. This allows you to cast a "cross-hairs" target on the wall for ceramic tiling, for example. Berger's LM 301 is a slightly higher quality rotary level that can beam a laser line up to a 100-foot range, for a total 200-foot diameter circle. This is a manually adjusting laser level. It's interesting to note that the rotary laser, as a whole, does not turn; it stays perfectly in place. The internal laser beam does the turning. Rotary laser kits typically come with tinted glasses. These glasses are not designed to protect your eyes from the laser. Rather, they allow you to see the red-tinted laser beam better. 100-foot is a quite cost-effective rotary laser level from Johnson that has a simultaneous 90 split beam and is powered by 4 "AA" batteries. Tripod 200-foot. Rotary laser levels range wildly in price. Professional-grade rotary lasers can run up to nearly $3,000 for Agatec laser levels. That's why this Grip comes as a nice relief to DIY homeowners who may have only limited use for a rotary laser level: under $50. Suitable mainly for indoor use, this laser level even comes with its own 52" tripod, case, and charger. Ready for the big time? If you're a contractor who frequently uses rotary laser levels, you may want to go with Agatec. It's a sturdy device that can even drop up to one meter on concrete without breakage. The 220GC Agatec rotary laser level shown here casts an unbelievable 1000 foot diameter 360-degree laser beam.